"Mr. Roy is a capable and benevolent young man doing magnificently what many today deem impossible. He's doing battle with the entrenched, arrogant leftists and hawkers of political corruption who are doing their worst to destroy education in this country. It's easy to get discouraged about the young people today. Let's not forget that there are independent, productive young men like Anirban Roy out there." -- S. Michael McMillen, Columnist for The New Australian (1997). The finer things in life include a Cohiba Cuban Cigar and a Moscow Mule with friends. I was born on May 19, 1978 to Dr. Ajit K. and Mrs. Archana Roy in Brazil. I think I have led an awesome life so far, and I think I have accomplished a lot so far in life. I was had an amazing childhood, had my "15 seconds of fame" while being on Mr. Roger's as a kid, was an excellent student in my primary and secondary schooling, went to a top 50 university, and have had a great professional life since graduating from college. Moreover, I am a world traveler, and I am one that enjoys the finer things in life. My motto in life is to live life to the fullest. We were put on this Earth to enjoy each and every single day. Life is precious. I am a conservative, and I believe in upholding family values and morality as well as fiscal responsibility for the government. Life began for me in a small town in Brazil called Ipatinga in Minas Gerais. My dad was in Brazil doing consulting for a Japanese steel company in Minas Gerais. After seven short months in Brazil, my parents came back to North America. I grew up in the United States since I was seven months old, and I am a proud US Citizen. My parents said life in Brazil was pretty laid back and not bad for a developing nation. My parents had a nice high rise apartment with a seperate servants quarter for our live in maid and my nanny. My father went on to get his doctorate in engineering from Case Western Reserve University in Cleveland, Ohio. After completing his Ph.D in near record time, we relocated to Canton, Ohio where a brand new life began for my parents and me. I was selected to play my guitar and show the viewers at home how to learn a musical instrument on an episode of Mister Roger's Neighborhood in 1989. I have lived throughout this great nation of ours including Ohio, Pennsylvania, Texas, New Hampshire, Nevada, and California. I had a great childhood in Ohio and Pennyslyvania attending private Catholic school and growing up in a custom made English Tudor house which took over a year to build. 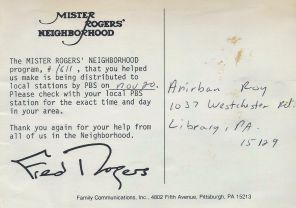 Moreover, I was even on Mister Roger's Neighborhood where I played my guitar. I was spoiled as a child since I was an only child for most of my childhood. Living all over the United States has been a blessing. I have made friends from all over the country, and I have got to experience all the diverse accents, local traditions, and weather across the country. I paticularly loved living in Texas! My "y'all" still comes out every now and then. To this day, I am still a Cowboys, Mavericks, and Rangers fan. The Stars moved to Dallas after we had left, but my NHL loyalties lie with them too. I was captain of the Whiz Kids team in 8th grade (yeah, I know kind of nerdy!) Furthermore, I got into extemporaranous speaking in Plano, and I won third place at the Plano City Championship during my first tournament! I was not as active as a child as I am now. I mostly stayed indoors and played Nintendo (yeah the original one) and watched all the great 80s sitcoms like Growing Pains, Full House, Cosby Show, Perfect Strangers, etc. Some of my favorite cartoons included Duck Tales, Transformers, He-Man, G.I. Joe, and Beverly Hills Teen Club. I was also a big Lego person, and I built "the Kingdom Of Legoland," which was run by King Exxon (Exxon was my favorite oil company when I grew up). I was not like most kids. I liked watching Stuart Varney and his financial show, monitored the stock market, and following politics. I would read the Statesman's Yearbook each summer too and find out as much as I could about foreign governments. When I did go outdoors, I played tennis and batmitton with my dad, baseball with some of the neighborhood kids, and mini golf. I tried some winter activities since we lived on the East Coast like ice skating, but I never got that one down. My brother, Angsuman, was born in 1990. At first, I was not happy losing "only child" status, but I am close with brother today. My brother and I did an awesome tour of England, Scotland, and France in 2012 visiting most of the famous sites including Buckingham Palace, Big Ben, Eiffel Tower, the Louvre, Versailles, Edinbourgh Castle, Windsor Castle, Stonehenge, and Oxford among others and staying at very nice properties like the Trianon Palace (Waldorf Astoria) in Versailles. My brother joined me on a cruise to the Bahamas as well in 2012 with some of my friends and my mother. We also went on a tour of Ireland in 2016-17 during New Year's. He was also the best man at my wedding in 2018. I love to travel! However, I am pretty spoiled so I travel in style. Whether it is first class air travel or staying in the top luxury hotels like the Waldorf Astoria chain, I make sure I am comfortable when I visit places. I have traveled all over the United States and the world. Traveling is a big passion for me, and I am fortunate to work for an European company which gives me over five weeks of vacation each year! I have been to the England, Scotland, France, Hong Kong, Macau, The Bahamas, Belize, Japan, Turks & Caicos Islands, Dominican Republic, Costa Rica, The Netherlands, Iceland, Ireland, Denmark, Croatia, Bosnia-Hercegovina, Germany, Singapore, India, Peru, Thailand, United Arab Emirates, Canada, Jamaica, Mexico, Panama, Turks & Caicos Islands, and Aruba. I have been to almost all of the states including Hawaii, Alaska, Florida, and New York. At last count, I have been to 45 states. Some annual trips I make include a winter getaway to Sun Valley, Idaho and a fun weekend with the guys in Phoenix for Texas Rangers Spring Training. In 1992, I lived overseas briefly when my dad was doing a consulting venture in Asia for a major conglomerate. The company kept us in a huge bungalow with armed guards, and we also had a full staff of servants to tend to our needs. We were served "high tea" on the veranda overlooking the lush gardens, and we had a person to do every little task you can imagine - even someone that came by in the morning and shined our shoes for us. We also had a great crew of chefs prepare both Western and Eastern dishes for us. They even made homemade ice cream for us. It was an interesting experience. High school was cool. I went to three high schools in three different states. Highlights of freshman year included going out with my first girlfriend, Katey (a cheerleader), the school dances, our 9th grade graduation ceremony and dance, and my going away party. My class was very small in New Hampshire so we all "graduated" from that school since they did not have any grades beyond 9th grade. We had less than a hundred students in our grade. I was also in both the plays that year at my school including playing Johnny Steele in "Meet Me In St. Louis, Louis." In Nevada, I was the Southern Region Vice President of FBLA. As a state officer and presiding officer of the Southern Region Leaadership Conference, I am about to bring the conference to order after a welcome ceremony. I started to get heavily involved in leadership roles and extra-curricular activities in Las Vegas at Cimarron-Memorial High School. 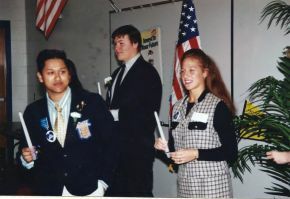 I was in National Honor Society, Future Business Leaders of America (FBLA), and French Club, serving as President of FBLA and Vice President of French Club. I was also the Southern Region Vice President for Nevada FBLA during my junior year. Some of my accomplishments in Nevada included creating a Southern Region Leadership Council made up of two representatives from each high school that had an FBLA Chapter. The Southern Region Leadership Council met once a month throughout the valley to plan and organize leadership development and community service projects for the area. Moreover, I hosted the Southern Region Leadership Conference with the help of several then and current Nevada State Assemblymen (all of whom are Republican). I had workshop presenters from all different kinds of industry to help high school students plan out their future career goal. Moreover, we had guest speakers from UNLV and the local Hotel & Gaming Industry. I received straight "A's" for most of my high school career in Las Vegas. I took all of the honors and AP level classes that were offered at my school. I became a country music fan after living in Las Vegas. After moving to California, I attended Livermore High School. I was elected President of both French Club and FBLA shortly after moving there. That goes to show that I am a natural born leader. 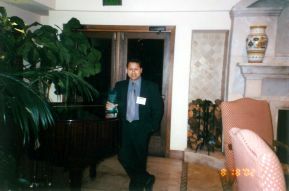 I was a member of the California Scholarship Federation (CSF) also. Other highlights of my time in Livermore included my Senior Year - ditch day in Santa Cruz, senior ball (prom), senior picnic, and Grad Nite at Disneyland. Out of all my high school experiences, I liked Livermore the least. Most of the students and faculty were quite liberal, not to mention 49er fans. I was a Cowboy fan in 9er country! Although, I did enjoy watching my Beloved Superbowl Dallas Cowboys win the Superbowl during my senior year and rubbing it in to the 9er fans. I was also not too impressed with the quality of the liberal CTA union teachers in California. They tended to inflict their own liberal viewpoints on the students and did not provide a medium for a fair and balanced political discourse in the classroom. I started college in 1996 at the University of California at Davis, which was ranked #42 in the country out of all the universities and colleges. I majored in International Relations and Political Science. I changed majors several times like the typical college student. I started off as a Computer Engineering major, but I did not like the math and sciences or the extensive programming. I thought about other majors such as Computer Science, Economics, and Managerial Economics also. However, I liked International Relations since it incorporated several disciplines into one major including political science, history, economics, and foreign language. College was awesome! It was a great time to meet new people and experience lots of new things. Here is a picture of some of my fraternity brothers with our "coaches" from Delta Gamma sorority for their charity event, Anchor Splash. It is a swimming pool based competition. I achieved a lot in college. I was a founding father in my fraternity, Phi Beta Lambda. We were one of the twenty national fraternities affiliated with the Inter-Fraternity Council (IFC). I served as Chapter President for four years, and lived at our fraternity house for one year. I also served as State President and Vice President for the state organization of the fraternity. Living in our fraternity house was one of my best college experiences. We had all our events at the house also including exchanges with sororities, rush events, and parties. Our Spring Fling 2K Party was one of the best parties of Spring Quarter 2000. Being in Phi Beta Lambda has been a great experience. We also participated in philanthrophy events with the Panhellenic sororites such as "Kickin With the Chi Os" soccer tournament and Delta Gamma's "Anchor Splash." I met many people who I consider my best friends. Most of us from the fraternity still keep in touch today, and we hang out regularly. We also had ski trips also to Lake Tahoe. I never quite mastered skiing however. DCR Chairman Anirban Roy presiding over the meeting on campus. They presented that gavel to me for my service to the organization. I got into politics after attending UC Davis. I served as Chairman of Davis College Republicans after the end of my freshman year. That alone was an honor to be trusted to lead such an important organization after only one year in college. I think I have always emerged as a good leader, and I earn people's trust as a fair and trusted leader in whatever organization I have served in. Moreover, I served on the state board for California College Republicans for four years including holding the #2 position as Executive Vice Chairman. After graduating from UC Davis, I was asked to remain on the California College Republicans State Board as the PAC President. I have managed local political campaigns and served as county coordinators for statewide races. 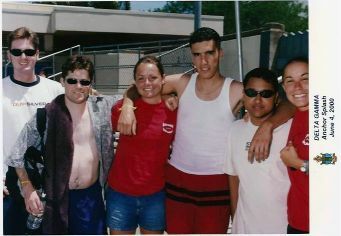 I also served as Northern California Youth Chairman for Quayle 2000. I founded a chapter of YAF at UC Davis, a conservative student organization. I was appointed to the State board of YAF as the Northern California Chairman in 1999. In 1998, I was elected to the Yolo County Republican Central Committee as the youngest member during the 1998 June Primary Election. I am a fiscal and social conservative. I officially graduated from UC Davis in March of 2001 with my double major as planned. 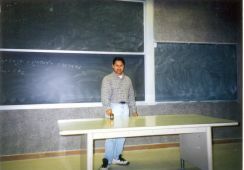 I miss my college years, which I feel have been the greatest years of my life up until I got into my chosen profession. Moreover, I think I got the complete college experience. I experienced Greek life with my fraternity, was Chairman of College Republicans, Chairman of YAF, founded other campus organizations, was a campus leader, and also served on the state boards for various college level organizations including holding the #2 position with the California College Republicans. Greek life was awesome - participating in fraternity exchanges, road trips, playing IM sports, and throwing amazing parties. In addition, I was on the Dean's Honor List and elected into the Order of Omega, a Greek Honor Society for only the top 3% of Greeks in the country. I have had a great deal of professional work experience as well during my collegiate years. While many college students are forced to work "odd jobs," I was fortunate to have worked on a more professional level at prestigious internships. I worked at the Lawrence Livermore National Lab for two summers of my college tenure designing web pages and doing computer programming for the National Ignition Facility (NIF). Working at the lab, I gained a good deal of real world experience. I had my own private office and was respected for my talents. The lab does a good job of treating their student employees as equals and not interns. Lawrence Livermore National Lab is very selective in who they select for these paid summer internships, and most of the candidates come from top institutions such as MIT or Stanford. It was quite humbling to be considered among the best college talent pool when I was selected to work there at the end of my freshman year. Some of my professional internships were in politics and/or public policy. I managed a political campaign in 1998 for a local position called Public Guardian in Yolo County. I worked as the Senior Research Analyst for a publishing venture here in Northern California, where I authored several sections of a book about the City of Davis called Davis Inside & Out. I was offered a paid internship with the Sacramento Housing & Redevelopment Agency during the summer of my Senior Year at UC Davis. I was involved with many projects at the agency including reviewing applications for tax credits submited by businesses who hired eligible employees. Towards the end of that summer, I got an irrestible offer from Burson-Marsteller Public Relations firm in Sacramento. Burson-Marsteller was the largest Public Relations firm in the world. The internship gave me more relevant exposure to my major. Since I closed the largest deal for the first company I worked for after college, I was presented with this trophy at the Villagio Spa and Resort in Yountville, CA back in 2002 along with a large check. This deal was $1.75M over 3 years. After graduating from college, I accepted a position as an Account Executive for a major telecommunications company in the Bay Area. Our primary business was business PBX systems, but we also did IP Telephony solutions, private cellular networks, server based PBX systems, and network services such as T1s and Frame Relay. I closed the largest deal in one our partner company's history, which brought in a total revenue of $1.75 million over three years, and I was promoted in 2004 to lead the VOIP group. One of the multiple gifts I received from closing the largest deal for Gobeam was a Tag Heuer watch which holds a special place in my life. It symbolizes what one can achieve with determination and being goal oriented. When I first started at ATS, I set a goal to bring in the largest deal for my company, and about six months later, I had achieved that. In 2005, I was offered a position with Schering-Plough Pharmaceuticals as a Professional Sales Representative, promoting Nasonex, Clarinex, Asmanex, Proventil HFA, and Avelox. These are all primarly respiratory products. Moreover, I have experience selling in the hospital environment also. I did really well so far at Schering-Plough, and I was now in my chosen profession. I was the top representative in my district for the last trimester in 2006 and also the 2nd quarter for 2009. Since 2002, Schering-Plough was my dream company that I wanted to work for. So, when the recruiter called me in 2004 to tell me about the opportunity to join them, I immediately jumped at the opportunity. I enjoyed my five year tenure at Schering-Plough greatly. My territory pod (or cluster) was great, and we worked well as a team. I left Schering-Plough in 2010 as the dust settled on the big merger between Merck and Schering-Plough to create the world's 2nd largest pharmaceutical company with a decent "golden parachute." 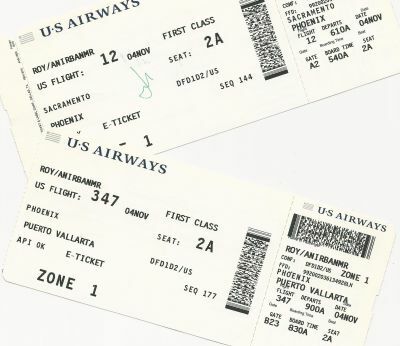 The offered us a nice departure package along with all our stock options that were still to be vested. At first, I went to ADP as a Major Accounts District Manager. However, after about 12 weeks, I realized that a pharmaceutical representative can not be happy outside of pharma. As a result, I was able to get back into pharmaceutical sales with Boehringer-Ingelheim Pharmaceuticals in June of 2010 through Inventiv Health, the industry leader for providing consulting solutions for sales, marketing, and clinical research to pharmaceutical companies. I missed pharma too much! Some of the highlights of this position included launching the first oral anticoagulant for NVAF in 55 years as well as being the regional leader for Inventiv's Circle of Excellence award as well as receiving High Meets Expectations on all reviews. In 2012, I was offered a position to join Boehringer-Ingelheim Pharmaceuticals directly after working with them through Inventiv Health for almost two years. I am really enjoying my new position and territory with my current pharmaceutical company. In addition to all the great benefits of working in the industry, I got over 5 weeks of vacation from Day 1 at this company. Moreover, I have an awesome team of co workers in my territory who work together well every day. My tenure at Boehringer-Ingelheim continued in 2016 with a promotion to our respiratory specialty team. I am honored and humbled to being able to work for such a great organization that is dedicated to making the lifes of patients better. At Boehringer-Ingelheim, I have sold pretty much sold all the primary care product portfolio for respiratory, cardiovascular, and diabetes. I launched two major products after joining BIPI too. In 2016, I finished very strong and won two national awards in our President's Club Extreme Rewards Program. I won the silver award for individual performance, and I received a bronze innovation team award. 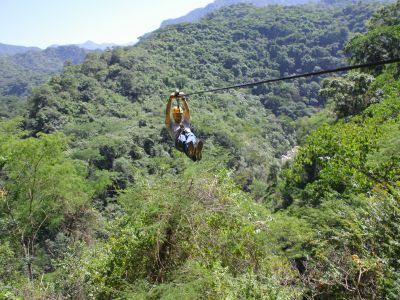 This is a good picture of me zip lining in Mexico over the jungle canopy! As I grow older, I tend to be more adventurous. I enjoy water sports and snorkling (especially in the Caribbean). Moreover, I have done parasailing over the Caribbean in Cancun as well as flew a Cessna C172 with a pilot friend of mine. In addition, I love boating, white water rafting, and hiking around the national parks also. I did ziplining in Puerto Vallarta, Mexico too. I joined a COED softball team in 2012 to experience a sport similiar to baseball, which I love watching. I did very good in softball despite not playing before. My batting average was very high, and I made some crucial outs while being a 2nd and 3rd baseman. I also started golf lessons in 2012. In 2013, I tried cross country skiing and snow shoeing at the Resort at Squaw Valley for the first time ever. I have also done white water rafting on the American River also. In 2014, I tried snowboarding for the first in Banff, Canada. I like to consider myself a foodie. I love trying out new restaurants around the world and cuisines. For the most part, I have been to most of the top restaurants around the country - from Commander's Palace in New Orleans to Spago's in Las Vegas to Bouchon in Yountville. Another place I like is Fogo de Chao in Beverly Hills. I love Brazilian BBQ! Living so close to Napa, I have been to pretty much all the hot spots up there including Redd, Press, and Cole's Chop House. I love sushi (the rawer and fresher the better)! I could almost eat it everyday. When traveling in the Caribbean or South America, I recommend the Argentine grass fed Tenderloin. I have also been to some great restaurants in Europe too. In Paris, I recommend Le Moulin de Galette located near Montmarte. In Edinbourgh, I recommend Angels with Bagpipes for their awesome Scottish Lamb. In London, Veeraswami is by far the best Indian restaurant I have been to. Going back to Las Vegas, I would say Bazaar Meat is the best meat restaurant that I have been to ever. Moreover, I love Nobu and Sushi Samba in Las Vegas as well. On the island of Providenciales in Turks & Caicos, I highly recommend Coco Bistro. My favorite domestic wines are from the Stag's Leap area of the Napa Valley. I also love Far Niente and Rombauer. I also enjoy a good scotch or whisky. Jameson and Ginger is my usual drink of choice when hanging out at my favorite bar or club. Although, I am also big on Bulleit and diet. I like small batch bourbons. 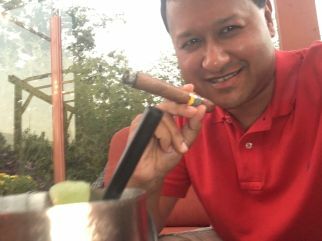 I don't smoke, but I enjoy the occasional cigar when hanging out with my buddies. As far as cooking at home, we started subscribing to Blue Apron in 2017 to make life easier for my wife and me. They send us three nutrious and delicious meals each week which can be prepared very easily. Joy and I are enjoying the "Drop In & Drinks" social at the Natomas Racquet Club. Hey, beer is heart healthy too from what I hear. LOL. I am a strong believer in wellness and living a healthy lifestyle. I work out for at least thirty minutes daily at my local gym. 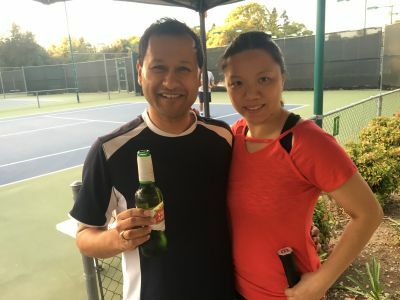 However, I am also a member of the Natomas Racquet Club where I play tennis and racquetball in addition to attending fun social events. For the most part, I keep a positive outlook on life always and don't stress out about things. I also have regular massage therapy from the best therapist I've ever had at Massage Envy since 2010. One has to take care of themselves! Skincare is also something I strongly believe in. I get regular microdermabrasions from my therapist at a local spa. In addition, I swear by skin care products from Philosophy, Peter Thomas Roth, Lab Series, and Clarin's Mens. I am also a techie too. My house is full of the latest gadgets and toys. I like to stay up to date with technology. All my PCs are custom designed and built by myself including my state of the art main PC. I built a media center PC for downstairs too. I am a PC/Windows guy when it comes to my computers, but I am an iPhone and iPad user when it comes to mobile devices. Furthermore, I have three home theatre systems, and I added a 3D plasma TV to my collection in 2012 and a 4K TV for my bedroom in 2017. One of my latest gadgets that I recommend to people is the WD Mybook Live network hard drive. It attaches to your home network and streams media files and documents to iPhones, iPads, and other devices even when you are not at home. Music streams really fast on it! I like to try everything at least once if possible including different types of food. I am pretty well connected so I can get into different clubs and top restaurants without any problems on a moment's notice. In 2006, I spent New Years Eve at the private House of Blues Foundation Room party at the top of Mandalay Bay, where many Hollywood celebrities such as Vince Vaughn were partying. In 2007. I was at a club called Tonic in Times Square to ring in the New Year. I believe in enjoying life! We rang in 2009 on a cruise to Cabo San Lucas on Carnival's Elation. It was my first cruise, and we had a really fun time. In 2009, we decided to spend New Year's in Vegas again. We rang in the New Year at the Palazzo and had dinner at their fine dining establishment, Woo. We had the pleasure to see Devon Aoki (Fast & Furious, War) dining there as well. We rang in 2010 in Vegas again at Lambourghini's restaurant at the Wynn called Dal Toro. In 2011, we went to Vanessa William's concert on New Year's Eve at the Riveria in Vegas. In 2012, my brother and friends rang in the New Year with me at Club Space in Miami, FL. I also recommend a visit to the London Ice Bar too - it is literally "cool." My wife, Joy, and I got married in 2018 on the beach in Cabo San Lucas, Mexico. We had our honeymoon a few months later in Providenciales, Turks & Caicos Islands. We have been going out since December of 2013 after we met at a party held by a mutual friend of ours, and we have traveled a lot together throughout the world. She works for the Army Corps of Engineers. Although we are polar opposites when it comes to somethings, we get along great, and we make an awesome team together. She is more of an outdoor person while I enjoy fine dining and more relaxing activities. 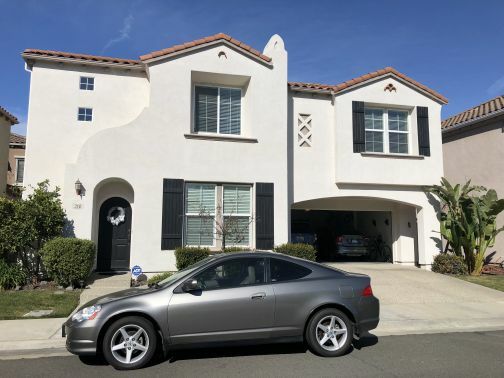 My beautiful home with my three cars pictured. My AWD SUV and luxury sedan are in the garage. My sports coupe is outside on the street. Shortly after getting my luxury sedan, I did sell the Acura sports car. I figured it was time to let go off that fun car. Today, I am a very content and successful young professional living in Northern California. I built a 4 bedroom house in Natomas Park, a master planned community in Sacramento, CA in 2007 where I still reside today. My house has a lot of nice upgraded features like granite counter tops in the kitchen and bathrooms, stainless steel appliances, 3 home theater systems, upgraded tile and carpet, and more. I am very easy going, and I like to just live and enjoy life. A lot of my fraternity brothers and friends have settled in this area so I have a nice group of people to hang out with in my sparetime. In 2015, I have updated my home with new home automation technologies through Wink, Honeywell, Nest, Amazon Echo, and Wemo. These devices make life easier as I can give voice commands throughout my house to turn on and off lights as well as adjust thermostat settings and even keep an eye on my house through live 24/7 video feed. For more information about me and up to the minute blogs, you can find me on Facebook and Twitter.